After getting sick for the first time in years (a sinus infection that I helped “manage” with large amounts of herbs, vitamin C and rest), I am reminded of how complex our immune system is, and how much more we are learning about it. This link to Kelly Brogan, MD is a good intro to this doctor and her world view, with an emphasis on the intricacies of immunity. The comments were also interesting. Even though I cannot remember where I read this research, it seems that the body does not do as well with single large amounts of oral Vitamin C as smaller amounts spread out evenly throughout the day. To get your blood titer up and constant seems to be the best strategy, and to do that, you want to take about 200 mg. of Vitamin C per hour. When I was sick I used a powdered vitamin C (with bioflavonoids, which help potentiate the C) and lemon juice. May the rest of this winter be a healthy one for you and your loved ones. I have been procrastinating about making my jun (a kombucha variant using green tea instead of black, and honey instead of sugar), mainly because it involves heating up 2 quarts of water, steeping the tea for 10 minutes and the herbs with it for 20 minutes, then letting it cool so the raw honey won’t be cooked…lots of steps and I’m tired. Well, I was perusing Yahoo news, and an article popped up about making tea. After reading it I realized that how I made tea was based upon what I heard decades ago, and here was info based upon some studies of what actually happens using various temperatures and times to steep the leaves. There is also some good info on the differences among the various types of tea (black, green and white) and that ideally we’d make a cup of each one of those teas using the best temperature and amount of time. Who knew?! And meanwhile I’m going to try making a batch of jun doing cold steeping, thus bypassing a few steps and making the whole job easier. Ever since the first free webinar series (which one could also purchase) about gluten sensitivity there have been multiple series about many pressing health problems. Much of the information has been pretty decent, and often collated from a good variety of alternative practitioners and sources. This one regarding cancer seems like another good bet to watch, with an interesting line up. I’ve earmarked 5 of the 9 episodes as having possibly new information for me, and I study this stuff as part of my business. It’s still tricky trying to process new information as I heal from my accident, but that’s what note taking is for! Too many of my friends and relatives have battled cancer, not always successfully. Let’s support one another in finding ways to prevent cancer, not just naively buying big medical’s hype about early detection. And not all alternative cancer treatments are wishful thinking and quackery: some really work well, even though they are demonized by big pharma. We’re at a tipping point in the fight to label GMOs and prevent the overuse of their toxic herbicides. We need you to join us in the march to victory! View and share our new video Demon Weeds! It’s the story of glyphosate-resistant weeds, a GMO herbicide, and the negative effects on the environment and human health. It’s more important than ever for you to take action! Increased use of GMO crops is causing the herbicide glyphosate (an ingredient in Monsanto’s Roundup) to be used in massive amounts. ANH-USA’s newest report shows that increased use of glyphosate can damage our environment, our economy, the livelihood of American farmers, and especially our health. You deserve to know what’s in your food, and what kind of farming practices your purchases support. Take action now! View and share our new video Demon Weeds! Visit www.ANH-USA.org/gmo to take action and view our reports. They will give you the real information about GMOs you deserve. Please take action today—there’s no time to lose. Our health depends on it. All ballots turned in Nov. 5th! – We Need YOU Today To Help WIN Yes on 522 to Label GMOs! Join the Yes on 522 campaign to win GMO labeling! Join us in the final days to stop Monsanto – Washington votes 4 GMO labeling Nov 5th – Join us to win the Food Fight of the century! Consider the facts: In the span of the past 12 months, voters in two states will have gone to the polls to win something so basic as the right to know what’s in their food. During this time, the world’s largest chemical pesticide companies and giant food corporations have spent a combined total of $68 million dollars to hide the fact that 75% of the processed food in the U.S. has been genetically engineered in a laboratory and these companies make a huge profit by keeping Americans in the dark. Right now, these same giant corporations are busy spending a war chest of $22 million to once again deceive voters. This weekend you can help turn the tide by making calls to voters in Washington state to make sure they’re not confused by Monsanto and the grocery cartel’s deceptive ads. Click here to make calls to help get out the vote for Tuesday’s Nov. 5th election so we can win Yes on 522 and win GMO labeling in Washington and beyond! The tragedy and outrage of these 2 elections is the fact that these same companies already label their products in 64 other countries around the world. They label GMOs in Europe, Russia, China and Japan! What are they trying to hide from the American public? THINK LABELS DON’T MATTER? Did you know that Frankenfish may be approved soon? If you have any question over whether genetically engineered foods should be labeled, consider the fact that in the coming months the Obama administration is poised to approve genetically engineered salmon. And now, because our elected officials have refused to pass common sense labeling laws, the world’s first GMO animal could appear on your plates without you knowing it. After genetically engineered salmon, what’s next? This week, the Yes on 522 campaign released a powerful ad to remind us all what’s at stake if we don’t win GMO labeling here in America – please take a look! The truth is, we all have the right to know what’s in our food and corporations who profit from selling food to us and our families do not have the right to hide that information from us. We shouldn’t a part of their grand science experiment! Please take a few minutes this weekend to help get the word out in Washington. If we win, we have a lot to gain and you can help be a part of that historic victory by helping spread the word. Click here to volunteer to make phone calls to voters in Washington to vote YES on I-522. All you need is a phone and Internet. You can even do it in your pajamas! The I-522 Ballot initiative is simple, it will inform shoppers whether their food has been genetically engineered in a laboratory or not and it has Monsanto, DuPont and the junk food companies running scared. Together we know we can overcome the opposition’s dirty money campaign – help put us over the top by making a call for GMO labeling today! Proposition I-522, a citizen’s initiative on the November 5 ballot in Washington state that would mandate clear labeling of genetically engineered (GE) ingredients on food packages, has become the most expensive initiative campaign in the state’s history. The high-priced battleground is pitting consumer and farmer advocates against multi-billion-dollar agribusiness corporations. A number of new opponents to the GMO food labeling proposal were recently revealed following the release of their names by the Grocery Manufacturers Association (GMA), a national business lobbying organization. The GMA had been, apparently in violation of state election law, hiding the identity of its donors who had provided more than $7.2 million to fight the consumer’s right to know what is in their food. The disclosure came shortly after Washington’s Attorney General Bob Ferguson filed a lawsuit demanding the GMA reveal the identity of its secret donors. With the outing of the GMA’s donors, The Cornucopia Institute has released an updated infographic detailing the financial expenditures of corporate and organizational supporters and opponents of I-522. 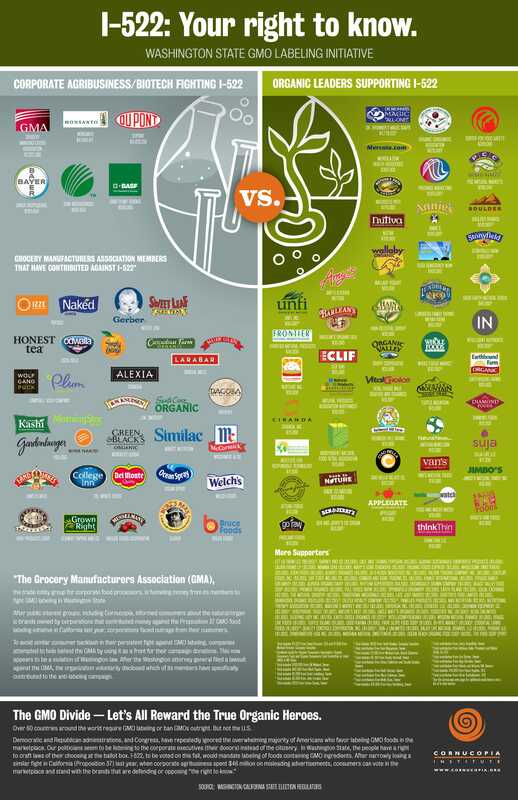 Finally a Mainstream Group Supports Labeling GMO’s! We have exciting news to share: Consumers Union, who publish Consumer Reports, has reviewed I-522. They determined I-522 is well written, gives shoppers clear, accurate information, and won’t raise the cost of groceries. This is a powerful counterpoint to the lies being spewed by our opponents and it’s critical that everyone see it – please share it on your Facebook page by clicking here. Washington is a vote-by-mail state, which means voters here don’t go to the polls. Over the weekend voters received their ballots in the mail and are voting right now on whether to pass GMO labeling or not. Please share this ad on your Facebook page to make sure all your friends in Washington see it.